So today’s question is “How Long Should My Customer Survey Be?” There’s a really simple answer to that. 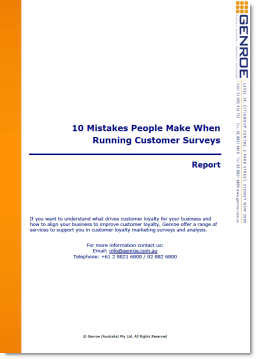 Your customer survey should be as long as it needs to be, but no longer. How long that length is really depends on what sort of an organisation you own. If you’re a business-to-consumer organisation with a lot of customers, then you could typically get away with asking a smaller number of questions to a larger audience. If you’re a business-to-business organisation, you really have to ask probably a few more questions to your small audience. Exactly how many questions is that? In a B2C context, you could probably get away with just three questions in your customer survey. Make sure one of those support qualitative feedback. In a B2B organisation, you probably need to have more, but don’t make it any more than 25 questions. The last point today, and the final point to think about, is don’t make your customer survey like a Christmas tree. Make sure that at the end of the day you don’t just keep adding questions and adding questions. That’s what everybody in the organisation will want to do. Make sure you stop it at maybe 25, or 3 or 4 if it’s a consumer survey. And stop the survey there and focus on that. That’s today’s question: How long should my customer survey be? If you have questions that you’d like to ask us, email your questions to questions@genroe.com.au. Thanks, and speak with you next time.